This rich soap is great for the whole family. This is enriched with lots of moisturizing shea butter. This heavenly soap smells like sweet almonds. 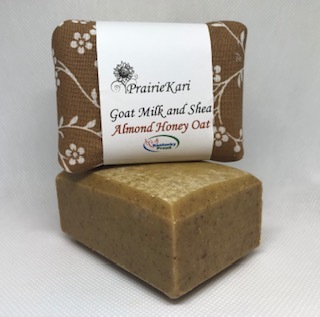 Ingredients: Olive oil, goat milk, shea butter, coconut oil,food grade lye, ground oats, Kentucky honey, natural almond fragrance oil, natural sodium lactate (for hardness). 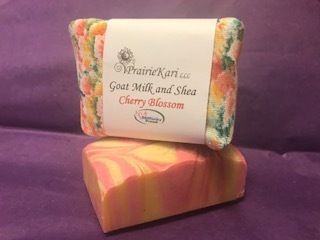 This soap has a wonderful old fashioned scent that is sure to delight women and girls of all ages. Many men love it too. Ingredients: Olive oil, goat milk, shea butter, coconut oil, food grade lye, frangrance oil, organic sugar, rose clay, Himalayan pink salt iron oxide, activated charcoal. 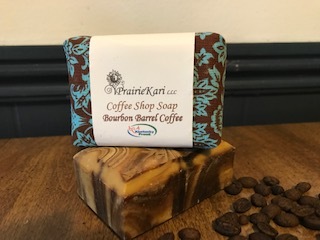 This soap is enriched with lots of moisturizing shea butter and smells like two of my favorite things… chocolate and lavender. Ingredients: Olive oil, local goat milk, shea butter, coconut oil, food grade lye, fragrance and lavender essential oils; baking cocoa and minerals for color. I sell a lot of this soap. 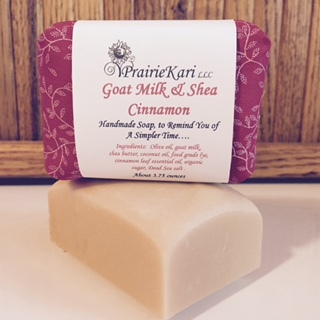 The spicy scent of cinnamon, in a mild Goat Milk soap. This is my personal favorite and my husband loves it too. -Ingredients: Olive oil, goat milk, shea butter, coconut oil, food grade lye, cinnamon leaf essential oil, organic sugar, Dead Sea salt . 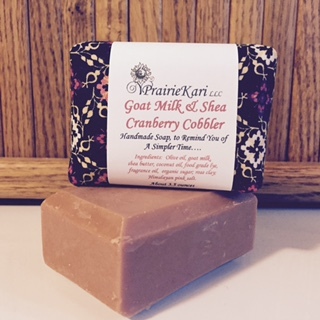 This soap is enriched with lots of moisturizing shea butter. This heavenly soap smells like cinnamon and hebs. Everyone in the family will love this rich soap. Ingredients: Olive oil, local goat milk, shea butter, coconut oil, food grade lye, fragrance oil, French green clay & activated charcoal for color. NEW!!! 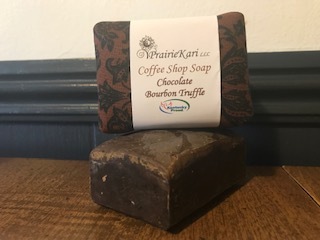 This newest soap in my Coffee Shop line smells very chocolaty and has the sweet scent of bourbon balls. My friend Linda makes amazing Bourbon Balls at Christmas time, and I love eating a couple with a cup of coffee. Inspired by one of my favorite treats, I decided to make a bourbon truffle soap. Perfect when you want a relaxing, spa experience at home. Also a great sink-side soap. Your kids will love it. Ingredients: Olive oil, shea butter, coconut oil, local goat milk, food grade lye, fragrance oil, expresso powder for color. 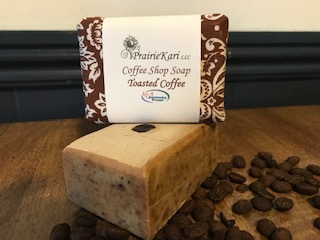 This soap has the fresh scent of cranberries, cinnamon and spices--a warm, homey scent that reminds me of flannel jammies and Christmas morning. Ingredients: Olive oil, goat milk, shea butter, coconut oil, food grade lye, fragrance oil, organic sugar, rose kaolin clay, Himalayan pink salt. 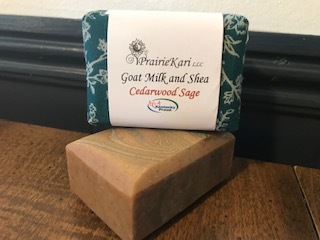 Woodsy cedar & the herbal fragrance of sage make this soap perfect for the gentleman farmer or the gardener. Enriched with lots of shea butter. Rubbed sage, ground cinnamon and kaolin clay are added as mild abrasives to get hands really clean. A friend of mine said this soap is the definition of clean. Ingredients: Olive oil, goat milk, shea butter, coconut oil, food grade lye, essential oil for fragrance: ground sage & cinnamon; rose kaolin clay; sea salt, vitamin E oil. sea salt & vitamin E oil. 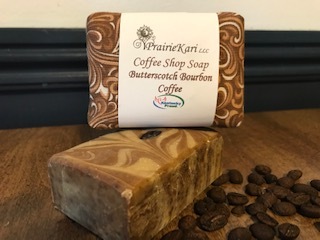 With a rich, earthy natural scent this soap is a balanced blend of cedarwood, geranium, grapefruit and oakmoss essential oils. Good for men or women. This reminds me of a rich spa scent, very relaxing. Ingredients: Olive oil, goat milk, shea butter, coconut oil, food grade lye, fragrance oil, esssential oil. organic sugar, Himalayan pink salt, brown illite clay, activated charcoal. 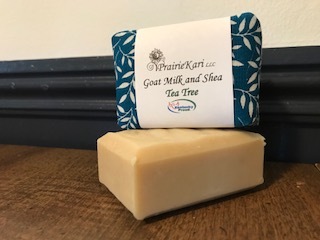 Goat milk and Shea Butter soap is so smooth and creamy and this has quickly become a favorite with my customers. 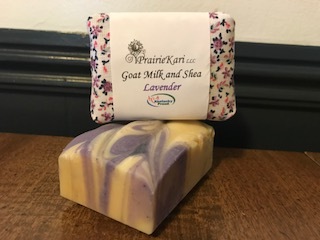 This soap is mild and smells just like hyacinths in the spring.--Ingredients: Olive Oil, Goat milk, shea butter; coconut oi, food grade lye, fragrance oil, organic sugar and sea salt. NEW! My newest custom scent. 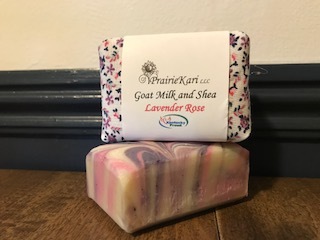 With an old fashion scent, this goat milk soap is scented with lavender and rose essential oils. Nice for any woman in your life. Reminiscent of an English Garden in the summer. Ingredients: Olive oil, goat milk, shea butter, coconut oil, food grade lye, lavender and rose essential oils for scent; minerals, mica and activated charcoal for color. 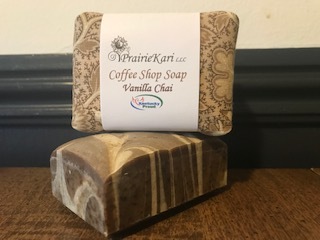 This is a lively fresh scented soap that is great for the whole family. Fresh smelling and hard working--just what every family needs. 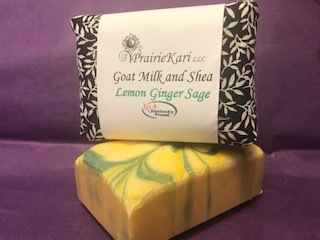 Ingredients: Olive oil, goat milk from local goats, shea butter, coconut oil, food grade lye, lemongrass essential oil, yellow mica for color. 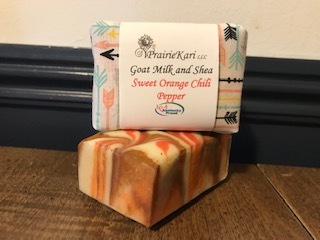 This soap is one of my best sellers. 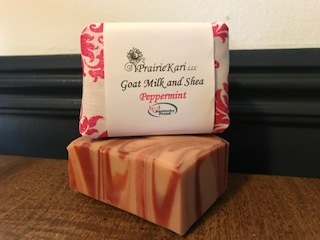 This fresh peppermint scented soap is milk and sudsy and smells like the fresh peppermint in my herb garden. Ingredients: Olive oil, goat milk, shea butter, coconut oil, food grade llye, essential oil, nautral mineral for color. Pine tar soap has been made for centuries. It is a favorite family soap—great for cleaning dirty skin and it smells very fresh. Ingredients: Olive oil; Kentucky spring water; coconut oil; pure pine tar; food grade lye; cocoa butter; castor oil; fir needle and lavender essential oils; pink Himalayan salt. NEW for FALL! 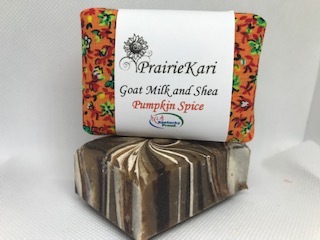 The delightful pumpkin and spice soap has smells like my famous pumpkin muffins but gets you nice and clean and no calories! Beautiful and sudsy and it leaves your skin smelling great. 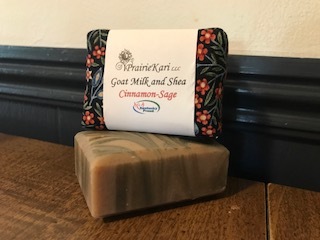 Ingredients: Olive oil, local goat milk, shea butter, cocnut oil, food grade lye, fragrance and cinnamon leaf essential oils, illite clay and titanium dioxide for color, ground cinnamon. Ingredients: Olive oil, goat milk, shea butter, coconut oil, food grade lye, fragrance and cinnamon leaf essential oils; illite clay; ground cinnamon; titanium oxide. 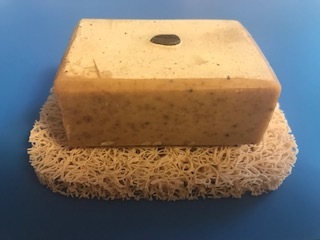 This salt soap is specifically designed to be a hand soap. It is imbedded with extra fine pink Himalayan salt and can be used to scrub dirty hands. 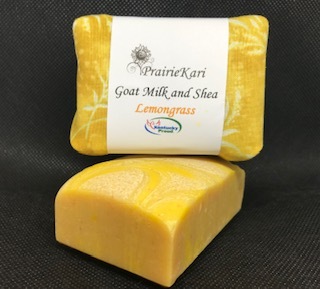 With a bright scent of peppermint, lemongrass and orange; this soap is a family favorite. It is harder than most soap and weighs about 5 oz. Ingredients: Coconut oil, Himalayan salt, Kentucky spring water, food grade lye, peppermint, lemongrass and blood orange essential oils, activated charcoal. This salt soap is specifically designed to be used as a heavy duty hand soap. It is imbedded with medium-fine pink Himalayan salt. It is wonderful for scrubbing dirty hands. It may be too scratchy for more sensitive skin. Ingredients: Coconut oil, Himalayan salt, Kentucky Highbridge Spring Water, shea butter, lye, castor oil, lemongrass & peppermint essential oils: French green clay, naturals minerals and mica for color. Each bar weighs about 5 oz. A wonderful fresh fragrance in a hard-working soap. Ingredients: Olive oil, goat milk, shea butter, coconut oil, lye, fragrance oil, minerals for color. 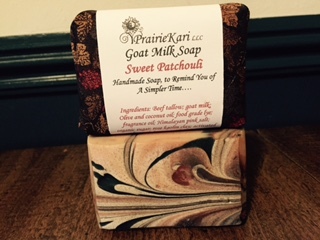 This is a lightly scented goat milk soap with a lovely sweet patchouli scent and a hint of vanilla. Sometimes Patchouli can be too strong, but this is a nice warm scent. 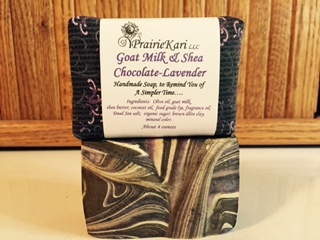 Ingredients: Olive oil, goat milk, shea butter, coconut oil, food grade lye, fragrance oil, patchouli essential oil. Many people have asked me to make tea tree soap because they like tea tree for its medicinal properties. 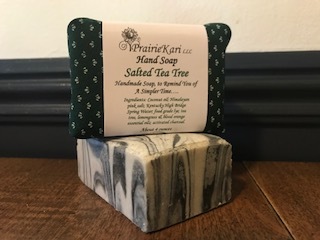 This soap has 1/2 tsp of tea tree in each bar and if you know anything about tea tree oil, that is a lot. This soap has a strong herbal scent. Ingredients: Olive oil, goat milk, shea butter, coconut oil, food grade lye, tea tree essential oil for scent. 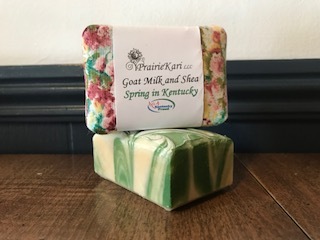 Many of my customers have asked for an unscented, un-colored, pure goat milk soap, so I came up with Mama's Best, named after the first goat I got milk from. Years later the milk comes from one of Mama's granddaughters. Good for folks that have sensitivies to scents and colors. Ingredients: Olive oil, local goat milk, shea butter, coconut oil, food grade lye.